You can copy existing MGT-based product limits to Account-based product limits to create account-based product limits from existing Gateway Login limits. This procedure is for copying product limits from the Account window; however, the same procedure applies when copying product limits from the Account Group window. Existing intra-product spread limits are mapped to the applicable future or energy limit. For example, spread limits for a CME 6A futures spread would appear as a CME 6A futures product limit in the database and Product Limit window after an upgrade. Existing intra-product strategy limits are mapped to the applicable future or option limit. For example, strategy limits for a CME OZD options strategy would appear as a CME OZD options product limit in the database and Product Limit window after an upgrade. Stocks and bonds product limits will be unchanged. Limits for unsupported product types (Swap, Warrant, Forex, and NDF) are deleted. Spreads and strategies that do not appear in the Guardian product table are imported as an inter-product spread or inter-product strategy. For example, an OZI strategy (product type “strategy”) with an OZI option and ZI future. The following table shows how existing fields for Gateway Login product limits have migrated to the account-based Product Limits windows in 7.17 and higher. Maximum position Maximum position (net) The total maximum position allowed across all contracts per outrightproduct. Long and short positions offset each other (e.g., the limitwill never be hit if only calendar spreads are traded). Note that in Gateway Login product limits, this limit was only configured when creating product limits for Futures. Maximum position Maximum position per contract The maximum position allowed per any one contract within a given spread/strategy product (e.g., if set to 5, the account cannot get longer or shorterthan 5 in the September contract, or in any other contract). Note that in Gateway Login product limits, this limit was only configured when creating product limits for spreads. Maximum long/short Maximum long/short position (gross) The maximum allowed sum of all long contract positions plusworking buys per product, as well as the maximum allowed sum ofall short contract positions plus working sells per product.This works as a spread limit. For example: If set to 5 and theaccount is long 3 in the Sep contract and short 3 in Dec contract,then an order to buy two Sep/Dec spreads (or any other spreads)can be entered, but an order to buy three or more spreads would berejected.The limit also accounts for outright orders. So, given the previousexample, an order to buy 3 or more futures in any contract otherthan Dec or an order to sell 3 or more futures in any contract otherthan Sep would be rejected. Allow Trading Trading Allowed Whether or not outright trades are allowed (e.g., if unchecked, anorder to buy 1 futures contract would be rejected; however, 1 spreadorder might be approved depending on the “Trading allowed”settings for spreads). Maximum order qty Maximum order size The maximum number of orders allowed for a single outright trade. Prevent orders that are more than X ticks away from the market Price reasonability It determines whether or not an outright order can be placed more than thespecified number of ticks away from the market. This can beconfigured to apply only to orders submitted into the market (e.g., toonly limit aggressive orders). This field is unchecked by default. Additional margin (+/- %) Additional margin requirements (+/-) % Used in increase or decrease the current product marginrequirements for placing an outright order. This can be positive (to require more than the standard margin) or negative (to require lessthan the standard margin). Allow Trading Trading allowed Whether or not trading is allowed for the spreads and strategies inwhich all legs consist of this product’s contracts. Tradingspreads/strategies that have legs in different products or producttypes requires an Inter-Product Spread or Inter-product Strategy limit to be created. Maximum order qty Maximum order size The maximum number of orders allowed for a single spread/strategy order. Prevent orders that are more than X ticks away from the market Price reasonability It determines whether or not a spread/strategy can be placed more than thespecified number of ticks away from the market. This can beconfigured to apply only to orders submitted into the market (e.g., toonly limit aggressive orders). This field is unchecked by default. Additional margin (+/- %) Additional margin requirements (+/-) % Used in increase or decrease the current product marginrequirements for placing an spread/strategy order. This can be positive (to require more than the standard margin) or negative (to require lessthan the standard margin). From the User Admin menu, select Account. Select an Account and click Edit. Click Import from Gateway Login on the Edit Account window. The Select Gateway Logins window appears. Highlight a gateway to which the product limits will be copied, and then click Select. TT User Setup copies each selected product limit to the selected gateway in the appropriate account. Q: In Gateway Login product limits, I had a limit that applied to all spread products (the Product was * and the Product Type was Spread), why do I have a Future and an Inter-product Spread limit after importing? A: In Gateway Login limits, your Spread product limit applied to both inter-product spreads and intra-product spreads. In account-based risk limits, inter-product spreads are configured separately from intra-product spreads. This results in a new Inter-product Spread limit appearing in account-based risk. Also, in account-based risk, you configure futures and intra-product spreads together, and therefore there is no longer a record for a product limit of type Spread, only Future. Q: I didn’t have Energy limits in Gateway Login product limits, why do I have them after importing them to account-based risk? A: In Gateway Login product limits, if an account had a limit that applied to all spread products or all strategy products (the Product was *), then that account could also be used to trade Energy spreads or strategies (if the market supported it). In account-based risk, you can set different limits for Energy spreads and Future spreads, so the migration creates both types. Q: What happens if I had a Spread limit configured in Gateway Login product limits without a corresponding Future? A: If an account was configured to trade a particular spread, then the limit is now migrated to a Future, but the outright settings (which did not exist) are disabled. Q: In Gateway Login product limits, I had a limit that applied to all future products (the Product was * and the Product Type was Future), and a limit for a Spread that applied only to the CME ES product, why do I have a Future * and a CME Future ES limit after copying? A: For those particular Gateway Login product limits, the account could be used to trade outrights for all products on the CME Gateway and spreads only for the ES product (CME Future *, CME Spread ES). After importing to account-based risk product limits, the account will have the following product limits: CME Future * (with outright settings from the Gateway Login CME Future * and spread/strategy settings disabled), and CME Future ES (with outright settings from the Gateway Login CME Future * and spread/strategy settings from CME Spread ES).This ensures that the account can still be used to trade all Futures products on the CME Gateway and only ES spreads. Q: How are limits for spreads or strategies with legs in different products migrated? A: The inter-product spread or strategy (for example Spread GLBGE) is migrated to a product type of Inter-product Spread or Inter-product Strategy, respectively. 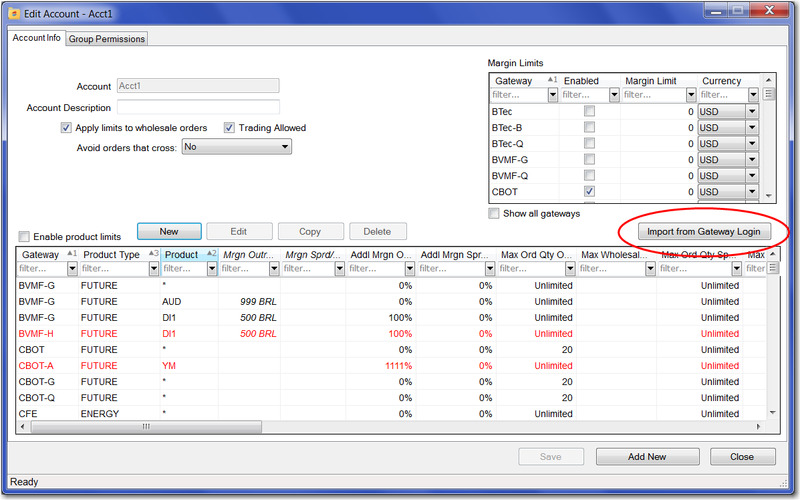 Trading allowed and Maximum order size settings are migrated from the spread or strategy. Other settings like Max position, if configured, do not apply as the settings for the individual legs are enforced instead. If product limits for the legs existed (for example, GLB, GE, or all products (*)), those product limits are also migrated. If they did not exist, you may want to consider adding position limits by creating product limits for each leg and setting the General limits. Q: How do I create limits for spreads or strategies with legs in different products after the import? A: Create a product limit for the Inter-product Spread (for example GLBGE). You can allow or prevent trading, set the maximum order size, and set price reasonability, as needed. To apply position limits, create product limits for each leg (for example, GLB Future and GE Future) and set the General limits. Q: How do I set limits for strategies with legs in different product types after the import? A: Create a product limit for the Inter-product Strategy (for example OZI). You can allow or prevent trading, set the maximum order size, and set price reasonability, as needed. To apply position limits, create product limits for each leg (for example, ZI Future and OZI Option) and set the General limits. Q: How are limits for strategies with legs in different product types migrated? A: When a strategy has limits in different product types (e.g., an Option and a Future), the limits for the legs are migrated, but the administrator must manually configure an Inter-product Strategy limit before the strategy is tradeable. The administrator should also verify that the legs are migrated as intended.For example SFE strategy OZI has an Option OZI leg and a Future ZI leg. In Gateway Login product limits, you would have created product limits for the OZI Strategy, the OZI Option, and the OZI Future. TT User setup 7.17 combines the OZI Strategy and OZI Option to create an OZI option record. These settings should be verified, leaves the Future ZI limit alone, and, unless there was a Spread ZI configured as well, spread trading becomes disabled. This prevents the account from being used to trade ZI spreads if it was not previously permitted to do so.To make the OZI strategy tradable, the TT User Setup Administrator must create an Inter-product Strategy record for OZI to explicitly allow the account to be used to trade a strategy that includes legs with product types of both Future and Option.